Paved over in 1942, what was once one of the biggest rivers in the area now flows under the Miguel Alemán Viaduct, a major east-west highway. Traffic at peak times is so bad that cars average six kilometers per hour – less than four miles per hour. But now a group of experts is arguing that the solution to the traffic chaos is to return to the past, tearing down the overpass and reopening the river to the light of day. The academics, designers, urban planners, environmentalists and artists have been pushing for seven years to transform Mexico City by rescuing all of the 45 now-covered rivers in the capital's Anahuac watershed. The first phase would involve uncovering about 9.3 miles of the Piedad River, now part of a drainage network. “This project shatters paradigms. It proposes to tear down a private road, which you cannot use unless you have a car. What we propose is that we remove the cars, open the pipes and treat the water. We need to transform the model of our city,” said urban biologist Delfín Montañana. The proposal, still in its conceptual phase, is to remove the pipes and replace them with an east-west biological corridor – from the Santa Fe area to the Mexico City airport. The corridor would eliminate the viaduct’s center lanes and retain the side lanes for vehicular traffic. It would also include public transport, an underground train, bike lanes, walking paths and green space. Its cost would be about 15 billion Mexican pesos, or $863 million. The capital's rivers became polluted over the last century. “There was a saying, 'let the river take it,' and everyone threw in all kinds of things. That's why they were enclosed in pipes,” said Montañana, whose proposals won the Holcim 2011, a top award for sustainable development. “The intubation of the sewage that flowed through Mexico City cleaned up large parts of the urban area. And this allowed the construction of broad avenues over them that form part of the Federal District's road system,” explains La Ciudad de México 1952-1964 , a book on urban development commissioned by the local government. “The idea is to change the city's model for its impact on the environment for one that reestablishes a relationship with the natural flows and currents, integrating the socio-ecological process and becoming a partner in renovating the water cycle and the Anahuac watershed,” Montañana said. The viaduct, named after a Mexican president, is now one of the areas most affected during the rainy season because the water exceeds the capacity of the drainage system below it. The proposed project would create an integrated system for managing and treating the water, separating rain from drainage water and returning the clean water to the river. Restoring the river would also expand green space, which according to global standards should be 16 square meters per person. Iztapalapa, the largest municipality within Mexico City, has only 5 square meters per person. The proposal may seem like a utopia for a city with 30,840 traffic incidents each day and a city that has long favored paved roads and even two-story highways. “It's not just possible. It's necessary. The city grew against itself when it encased rivers in pipes and polluted them. We must reconfigure the city for a more symbiotic relationship with the forests and rivers,” said architect Elias Cattan, another Rio Piedad renovation project supporter. A few years ago, the same group of activists created “ Picnics on the River,” an initiative to make civil society aware of the need to restore the Piedad River. Despite initial support in the Legislative Assembly, the proposal didn’t pan out. “I see it as viable, if and when there's a political will to do it. And that's where I see it as inviable, because this government doesn’t want to do these kinds of things. It doesn’t see them as possibilities nor does it understand them,” said Luis Zambrano, a researcher with the Biology Institute at the Autonomous National University of Mexico. “Where there is space available, they see two-story highways and big avenues. They are not thinking about green. There must be a more modern view of society. With a river you increase biodiversity and you guarantee the lives of species like salamanders, crayfish, small fish, grasses and bulrush plants,” Zambrano added. It has happened in other cities. Seoul, South Korea recovered the Cheonggyechon River, which had been covered by a highway. 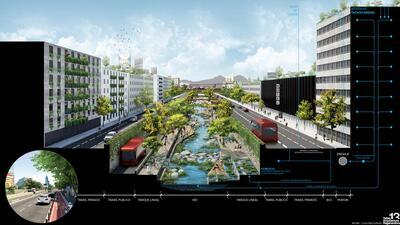 And cities like Singapore, Madrid, Los Angeles, Portland and Caracas all have initiatives to recover rivers. In Mexico, Montañana also has worked on proposals to revive the Sabina River in Tuxtla, the Atoyac in Puebla and the Tizates in the Valle de Bravo. But none of those proposals have received government support to continue them. “Sooner or later, we will see a flowing river in this city,” Montañana predicted.